You've put a lot of work into this project so far. It's understandable if you're beginning to get a little worn out. The worst thing that can happen now is for all of that hard work to go to waste. Hiring an under-qualified or inexperienced contractor can end with your installation looking as though little or no work went into it at all. And though the color swatches strewn out on your coffee table may beg to differ, all anyone will see is the shoddy installation. That's what Sherlock's Carpet & Tile is here for. Our highly qualified professionals work full time for Sherlocks, and have experience with all types of installation. From flooring to fixtures, and everything in between. We've spent years building a sense of trust within the Orland Park area, satisfying customers and exceeding expectations along the way. You can be sure that we will show the proper amount of respect to the work that you've put into your renovation. Our installation techniques will arrive at your home on time, and clean up every bit of mess that’ made during the installation, including vacuuming. With our commitment to finishing your installation well, on time and under budget, you can finally stop worrying.You have agonized over which styles best accentuate your decor; You've compared color swatches to see which pigment best captures the natural light in your home; You even made the tough choice as to which material had the right balance of durability, luxury and budget-friendliness for your lifestyle. Let us do the rest. We know that each installation is a work of art; we put our heart and soul into making your home look its absolute best. 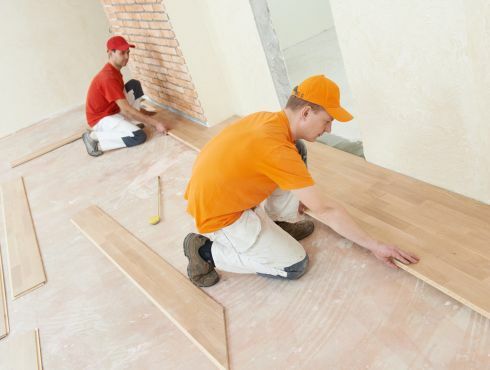 We install everything from hardwood, carpet and tile floors, to countertops and kitchen fixtures. We also provide lifetime guarantees on all of our installations, so that you never have to worry. For more information or to set up an appointment call (708) 232-3400.